GOV.UK Verify is a way to prove you are who you say you are online. By doing this, you can access government services, such as checking your income tax or state pension and viewing your driving licence information. As these are services that contain confidential data, we are committed to making sure our users’ digital identities are secure. We work with a list of identity providers who will check your identity and confirm it to the government service you are using. This means the government service doesn’t know which identity provider you have chosen and the information is not stored in one place. Our work protects user data and means criminals cannot masquerade online as someone they’re not. With identity fraud costing the government between £1 billion and £4 billion a year, we must continually evolve and grow our security measures to counter identity crime. We are keeping GOV.UK Verify secure through cross-government collaboration and sharing knowledge with selected private sector organisations that are facing similar challenges. We have written before about the kinds of fraud our identity standards prevent and how we keep data safe on GOV.UK Verify. As more people sign up for digital identities and the GOV.UK Verify programme evolves, we need relationships with others facing the same challenges, to counter crime caused by identity misuse at the earliest stage possible. The Counter-Fraud and Threat Intelligence team sits within the wider GOV.UK Verify team and specifically works to counter identity-enabled and identity-dependent crime and fraud. Identity-enabled crime and fraud refers to traditional criminal activity which is exacerbated by the misuse of identity, for example identity theft. Identity-dependent crime can only be committed by the misuse of identity. We have formed an Identity Misuse Group on the National Cyber Security Centre’s Cyber Security Information Sharing Partnership (CiSP) platform. If you work in government or industry and are interested in preventing identity misuse, you can join the group via CiSP’s website and request to register your organisation if you’re not already a member. We have created an Identity Risks and Identity Standards Consortium, which is made up of leading UK academic institutions and chaired by Professor Tim Watson from the University of Warwick. We hold quarterly meetings to share knowledge and expertise. It is important that we work across government to make sure we counter shared threats and ensure security information is shared with relevant departments. Collaboration is done through workshops and meetings with teams in other organisations. We ran one such workshop earlier this month. Attendees included staff from central government departments and a wide range of public sector organisations. As part of the GOV.UK Verify programme, we can gain insights from our colleagues working at GDS. And, our team of specialised identity crime and identity fraud experts can feed back information into the government’s identity standards, which helps make them as robust as possible. 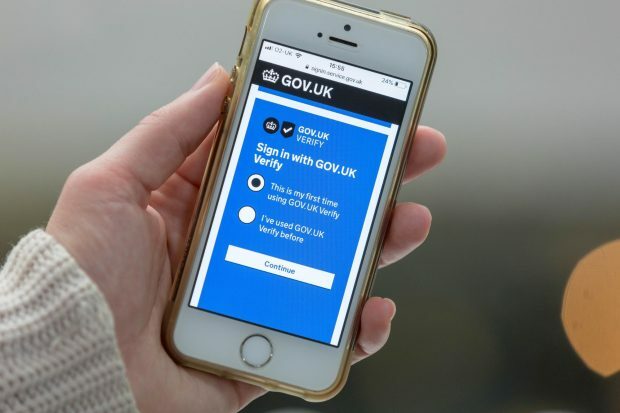 The use of digital identities will increase as GOV.UK Verify is opened up to the private sector. This means we must keep working to counter identity crime and fraud. By spotting fraudulent transactions early, we save the government money and we protect our users. All our work within government, and also with the wider private sector and academia, will help counter fraud and reduce the misuse of identity. Don’t forget to sign up for updates. 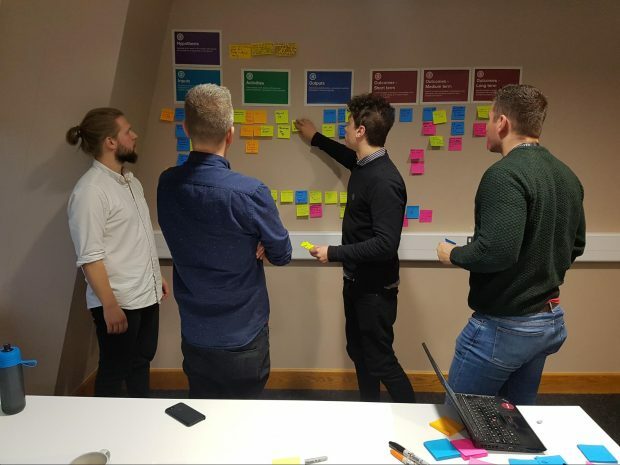 Building on the work done by the Digital by Design team, we’re helping Stockport Council take human centred design approaches beyond digital, working together to design better end to end services for the citizens of Stockport. During our time together we’ll be looking specifically at how money comes into the council from citizens, how it flows around and is managed internally. We’ll be starting within one discreet area — Waste services — to prototype customer experience improvements and identify new ways of working to eliminate the inefficiencies we know exist. ‘Going beyond digital’ isn’t the title of a science fiction voyage into the unknown. We’re talking about how we use design to explore the wider experience of services beyond their digital parts. 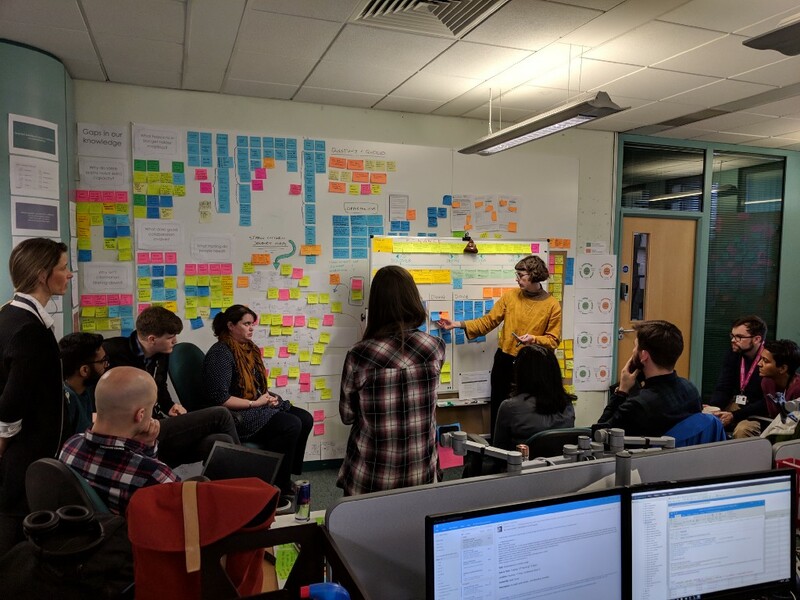 Together, we’re working to push at the edges of end to end service design, working with services across the council to truly develop empathy with citizens and the services they use. Digital is only one part of a service. Users experience a variety of different situations and touch points beyond digital when interacting with a council service, like receiving letters or working with staff. It’s important we view service experiences for people as a whole, rather than individual pieces. We’re developing a holistic view of a service. With a holistic view, based on good insights, we can take what we know and focus on areas where we can create the most valuable and impactful change. It’s a complicated thing to break down, but having everyone in the council on board with our goals, we can identify the right changes. This is an exciting piece of work where we’re truly developing services across the council, from designing improved Finance services to Waste services. Through prototyping new ways of working across teams and the services they touch, we’re finding design patterns that can be applied to other parts of the council. Working in these multidisciplinary teams that reach across different areas of the council, we are designing better experiences for staff and citizens. Having such a team is important because it enables us to understand a broad range from various perspectives. We need people with different ideas and perspectives to offer new ways of thinking about complicated problems. Having different minds working towards the same goals means it’s easier to take different ideas into the prototypes we test with people. We’re currently entering an exciting phase of work where we’ll be looking at opportunities based on our research. We’ll start to look at ways of prototyping different ideas, so we can test our assumptions and learn even more about what users really need from the services Stockport Council delivers. This is the bit that always feels like someone switched on a light bulb. Where we come out from under the post-its and into a bright room filled with ideas for better services. It’s good to work with the talented team at Stockport and to have so many skills to hand. 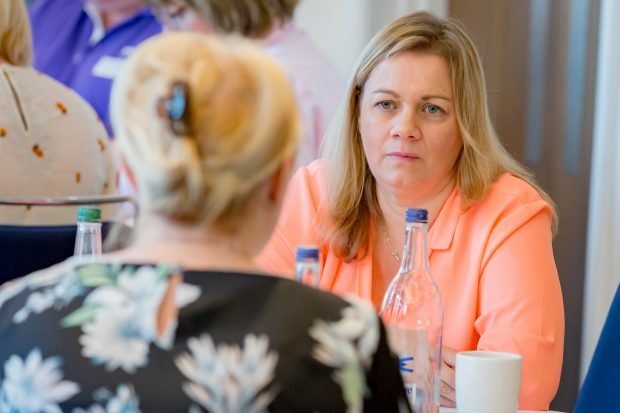 We’re used to working with people at the start of their transformation journey and it’s been great to join a team who’ve already started on this journey and who are keen to push their skills and knowledge to the limit. It’s exciting to think about where we’re going and what we’ll achieve with so many enthusiastic people on board for the voyage. This post was first published on the Digital Stockport blog. Beyond Digital was originally published in FutureGov on Medium, where people are continuing the conversation by highlighting and responding to this story. Six months ago the Ministry of Housing Communities and Local Government (MHCLG) published their local digital declaration. The response to it since then has been really encouraging. One of the ambitions in the declaration that’s getting a lot of discussion is about “fixing the plumbing”. The challenges facing central and local government include being locked into large legacy systems. Sometimes the lock-in is because of contracts, but normally it’s because moving away from them is such a massive undertaking, an all-or-nothing affair. It might be tempting to look back at the origins of that system to place blame, but often those systems did a decent job when they were first brought in. What they haven’t done between then and now is adapt to the changing context your organisation finds itself in. Doing one big procurement and one big migration to replace the whole system might fix things for now, but in a few years you’ll be staring down the same problem again. So when you hear about fixing the plumbing it’s about organisations using technology that can be upgraded and replaced one piece at a time, so they can respond more effectively and more efficiently to the needs of their users as they change. That means using technology that is interoperable, and is why open standards are so important. Interoperability is as much about good communication and collaboration as it is better technology. It’s about designing, agreeing and using common standards that make it easier to substitute one piece of software for another. It’s about making it easy to write custom software for one piece of your service and use off-the-shelf, open-source or platform software for another part. Software built on open standards is why you can use whichever browser you want to access the web. And those standards can be as much about your processes as your technology. If you use the same process as a dozen other organisations, you’re better placed to use the software they’re using. Having services based on standards makes it easier to reuse work from other organisations, and to replace parts of the system when they’re no longer fit for purpose. It can reduce the long term cost of ownership, and it can make it cheaper for other people in the future. But it doesn’t make it quicker to build things. Building to standards can take more work in the short term, especially when those standards are new and less stable. Working in this way pays off only in the long term, and only for the wider community. A single organisation doesn’t have much incentive to work like this unless their mandate is enormous – big enough that interoperability within only their own organisation is worthwhile, even without adoption from the wider community. That’s often the case for central government, like the Department for Education delivering a set of national services for teachers and schools. But it’s less often the case for local government, for example, delivering local services for social housing tenants and constrained by tight budgets. Given that, the way MHCLG are approaching this is good: they’re providing £7.5m of central funding to encourage organisations to build in a way that helps everyone in the long term. It allows local government organisations to focus on the problems they’re trying to solve, whilst recognising that they need extra support to make interoperability a reality. I’m really optimistic about the effect MHCLG’s approach will have across local government, but to repeat myself: this work will pay off in the long term, and for the wider community. Local government still has to deliver services right now through increasing demand and decreased funding. Dogmatic adherence to standards is more likely to hurt you than help you, particularly as an early adopter. Use and contribute to standards where they make sense for you, but focus first on solving your organisation’s problems and only second on solving common problems. Be realistic in what you’re trying to solve – you’ll be much more successful if you aim for (and accept!) incremental progress rather than trying to rebuild entire services. Some of that progress, even if only incremental, will involve tearing apart your existing silos and processes. The organisational turbulence will be very real, and you need to help your people through it. I’m always happy to hear from other people thinking about these type of things, so if you’re interested in talking about it over a coffee please get in touch. The post Fixing the plumbing appeared first on dxw digital. This week was mainly a write-off after I came down with a viral chest infection and spent most of the week in bed sleeping. However, before succumbing Bronte-like to illness, I did head up to Manchester for my first time hosting Classic Album Sundays at 33 Oldham Street. I love the community building around this listening experience event and it was a beautiful thing to talk about Amy Winehouse’s Back To Black and listen to the album in full. There are a couple of things which struck me – first, those of us who fully give ourselves to music and specifically listen are probably among a minority now and music is far more often the background to another activity or at the very least to scrolling a screen; and secondly there is far more to Back To Black than the tragedy of Amy’s personal life. Putting phones away and sitting in a room of strangers while an album plays can feel disconcerting at first – what do I do with my hands? Where do I look? – but it gives great rewards. The experience is the experience, not diluted or missed in the moment through sharing, and this gives us a chance to really notice things and to connect on a personal level afterwards. There’s a huge amount of creativity and connection which can come from these deep listening and single-focus moments and whether it’s listening to an album (while doing NOTHING else) or staring out the window building in time to let the mind wander is refreshing and more productive than you might first assume. Vic Turnbull will host the next event on 5 May where she’ll be talking London Calling by The Clash and playing the album in full, before I’m back on 2 June with a very special album indeed (keep an eye out for the announcement soon). Classic Album Sundays is a worldwide network of listening experiences – delve into the website here. I’ve also been working on some new workshops with Dan Slee – somewhat crazily it’s ten years since I first met Dan at LocalGovCamp in 2009 and we enthusiastically looked over what the other was doing with our respective local authority employers as we lead the vanguard of introducing social media to the public sector. We’ve drawn on all that experience – and more as communicators – to put together a Vital Facebook Skills workshop. Far from losing traction following data scandals Facebook is still proving a force to be reckoned with in communications and while lots of skills are transferable between platforms and channels this workshop focuses in on the things you need to know about content for posts and Pages, engagement in Groups, what Messenger means for your customer service and comms, and how to get the most bang for your buck through doing Ads right. If you’re a public, or third sector organisation, and you’re using Facebook as part of your comms, marketing and engagement work you need to head along to this workshop and find how to maximise what you do on the platform. 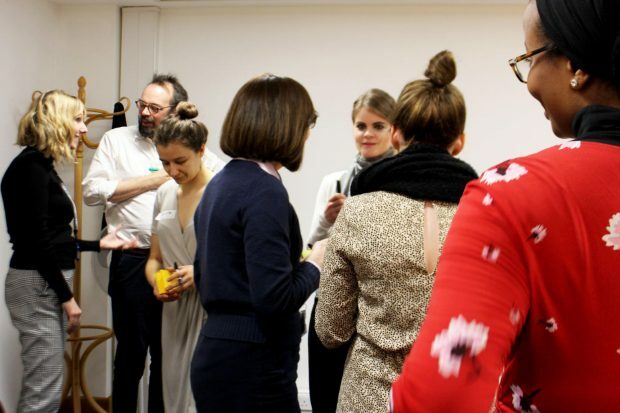 There’s four workshops happening in June in Manchester, London, Belfast and Edinburgh and you can find out more as well as get some great insight from Dan’s recent post here. My professional reading is still focused online in short-form at the moment. I have a stack of books To Be Read but I’m finding the real gems in blogs, particularly from individuals working in and sharing their experience in certain areas. Otherwise I fell deeply in love with Margaret Atwood’s The Blind Assassin and devoured the gorgeous prose of this novel and the bittersweet love it contained in just a few days. At the start of the year I tentatively set my GoodReads reading challenge at a book a month but I’ve already hit that target and have upped my challenge to 20 books by the end of the year. It’s not about the number but the outcome – I’m so pleased I’m making time to read and explore the world’s created in other writer’s heads and through them find a better understanding of myself and of the work I have to do as an author. Find me on GoodReads here. As it was release week at Reckless Yes there wasn’t much else to listen to apart from the debut EP from Panic Pocket, Never Gonna Happen. I’ve said elsewhere that not only is this a great musical release from the band but they are really inspiring too. Two years ago neither Nat or Sophie had picked up instruments or been in a band and now, here they are, with some wonderful press and a CD run which will sell out during release week. They encapsulate the spirit of Reckless Yes: of taking the challenge which sits just outside your comfort zone, of creating something from nothing, and not letting other’s ideas of what needs to be in place stop you doing the thing you want to do. You can check out the release here. A quieter couple of weeks coming up as I recover from illness and spend time with the family while the children are on the Easter break. This point in the year is also our major planning time for Reckless Yes where we look at how things have gone in the last 12 months and look ahead to make short, medium and longer term plans. As ever I’m really excited by the ideas we have and the journey we’ll be going on to get there but I’m also more confident than ever in our vision and our ability to build a label which fits the modern music scene and which operates ethically in favour of the artist. Offender Management in Custody (OMiC) is a new policy being introduced to support a rehabilitative culture in prisons. One aspect of the policy is the introduction of the Key Worker role which is well underway across Wales and England. Our focus has been on the next phase of policy implementation – case management. Since summer last year we’ve been researching the users of potential services to support OMiC case management. Offenders in prison who’ve committed serious crimes currently have an Offender Manager based in the community who manages them throughout their time in custody and during their time on licence after release. This Offender Manager is responsible for the person’s risk assessment and rehabilitation including deciding what interventions the person must complete, evaluating them ahead of any parole hearing, and working with the victim liaison officer where applicable. By the end of this year, this will instead be done by someone in prison – so there’s lots of recruitment, secondments and training going on in prisons to support this significant change. So how have we done user research without users? Our first challenge was to find out how an offender will be allocated to an appropriate Offender Manager with the right skills for the case. Offender Management Units in prisons currently allocate Offender Supervisors to the majority of their sentenced prisoners, so we’ve researched how that’s done, reviewed the new policy and tried to extrapolate from that to identify what our users will need. The new policy will see responsibility for an offender transfer from prison to a community-based Offender Manager before their release. To understand needs regarding this handover process we got our future users to design a product for us. 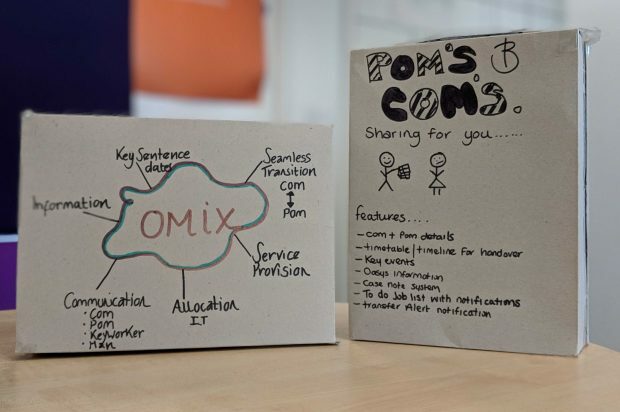 Workshop participants came up with some great product ideas in the form of cereal boxes which gave us important insight into the main concerns and what the value of a digital service would be. Lots of meetings with subject matter experts in the policy team, research interviews with staff, and attending stakeholder meetings continue to help build our understanding of our future users. What challenges have we faced? In the early days, our preamble to the research session was often the first time our participants were hearing the detail of the future policy they’ll be working to. Having a member of the policy team working alongside us has been invaluable to make sure we’re providing correct information. Despite the fact that OMiC is new, we’re not working in a greenfield site. There are existing information systems used by many different groups of professionals across numerous settings. We’re working increasingly closely with other product teams to coordinate our work and ensure that the future user experience is cohesive. User research in prisons takes time. The current limitations of technology for staff in prisons means we have to physically travel to conduct research sessions. When there’s only one potential participant in each prison for some research topics, that equates to a lot of elapsed time on each round of research, or fewer participants than we’d like. We’ll shortly be piloting our first digital offering – an allocation service – at two prisons in Wales. This will be critical to understand how well the service works for users. Up to now its been straightforward to test the completion of individual tasks in the service prototype. But in reality users will be doing many different tasks concurrently, for different offenders all at different stages in their sentence. The first release of our service will inevitably have issues and we’ll need to continue to learn about our users as they settle in to their new roles and responsibilities. But equally the pressure is on to build more services for our users to facilitate further offender management tasks. We’re looking forward to seeing how the service works for users at our pilot prisons in Wales, and acting on their feedback to improve it before we roll out to more establishments. The report from the private beta assessment for NICE’s comment collection service. ‘Comment collection’ provides a way for NICE stakeholders (people who the guidance effects) to comment directly on the documents produced when developing guidance. It also provides a way for teams within NICE to request these comments, set up the consultations, and collate the comments for response in a way that avoids repetitive manual handling. Primary user groups are NICE guidance producers, coordinators and external commenters (organisations and the public). The team met point 1 of the Standard. The team understand the needs of internal and external users of the service. They are capturing insights from users in a variety of ways, including usability testing, survey responses, hotjar recordings and calls from the enquiry handling team. Carry out usability testing more regularly and split this into rounds. For example, test with a group of participants, analyse and iterate (Round 1). Then test the iterated journey with a group of different participants (Round 2). Conduct observations and test usability with internal users who receive and respond to comments (NICE staff) and those who modify the guidance based on comments (Advisory Committee Members). There needs to be a robust way of capturing and responding to internal feedback, making sure issues are logged, analysed and prioritised in the UX and design work. Make sure that public and external users are not deprioritised against internal users. Particularly those who may find it hard to influence NICE guidance because of lack of easy access or digital ability. Consider paying incentives and / or using a recruitment agency to recruit user groups that meet your criteria and aren’t already familiar with the concept of NICE guidance. This has the added benefit of saving the user researcher’s time spent on recruitment, will encourage participation and make sure they get the right people. The team met point 2 of the Standard. 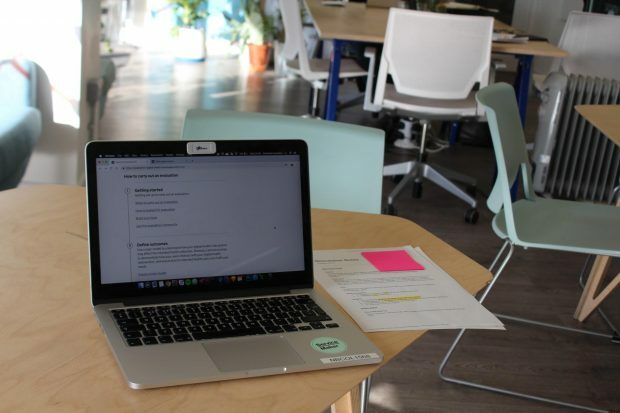 The user researcher acknowledged the need to do more focused usability testing going forward and they are looking at better approaches to analysis. The whole team have been involved in user research, observing and taking notes. The team plan to test more things they are aware need fixing, such as navigating from the overview page to the main content. There is another accessibility audit coming up. Conduct more accessibility testing with representative users who have hearing, motor and cognitive impairments such as dyslexia. Work out how to capture survey feedback from external users earlier on in the journey. The survey has a small number of responses and is only available once the user has completed a comment. This could mean it is only capturing responses from those who have been successful. In usability testing, provide each user group with relevant tasks/scenarios. For example, for a first-time user it would be good to explore how they arrive at the correct place, as opposed to starting all users from the overview page. What would they type in and where would this take them to? Different scenarios will help test this. Do more contextual user research with internal users and observe them using the service. The team met point 3 of the Standard. There is one service manager who leads multiple teams working on different parts of a service and/or code base. Team were able to respond to ad-hoc requests with mock-ups and quick testing or by working closely with users, demonstrating to senior people they were happy with the service. The team are co-located and pair up across disciplines, for example developers with user researchers. It’s good that developers observe user research sessions. There appeared to be a representative mix of genders in the team. Review whether it’s a good idea for content to be covered by a user researcher. Are there other content designers in NICE who could support? The team met point 4 of the Standard. The team work well together pairing up to approach problems across User Research, UX, Design, Testing and Development. User research revealed findings that the team didn’t expect, which challenged their initial assumptions. One example was the use of icons, they thought these would help users but during usability testing participants didn’t understand what they meant. The team have responded by replacing icons in future iterations. The team have regular show and tells, sharing their work with the rest of the team. Consider ways of capturing issues from different sources in a centralised place. This will provide a holistic view of the service and help to prioritise what should be worked on when. For example, the user researcher has kept a thorough log from usability testing. When issues arise from survey responses and the inquiry handling calls etc. the team could combine these into one place to see the impact and frequency of issues across multiple sources. The team met point 5 of the Standard. The service manager was able to explain the lifecycle from user research through to design and development. The team are internal staff and work closely together in the same space. The prototype has undergone various iterations throughout beta, responding to needs from user research. Make sure user research is happening in some capacity during every sprint. Once something has been tested, analyse, iterate and test again. Try to avoid iterating during testing, this is what the next round can be used for. Do mobile testing on different devices to understand the look and feel, page layout and usability. From the script, it looks like mobile was tested via a computer screen. This means the usability on a mobile device (for example, selecting text and leaving comments) may not have been accurately represented. If the participant has an iPhone or iPad, they can record their own screen or using Lookback, Reflector or Quicktime player the screen can be projected to a computer whilst they interact with the mobile device itself. The team met point 6 of the Standard. There was a detailed justification for each technology choice. Sensible and mature technology has been chosen. Ensure they have explored how they plan to upgrade components when new releases are available. The team met point 7 of the Standard. There was a strong emphasis on privacy and user security. Consider whether personal information needs to be in the (internal) XLSX download. Look at whether automated tools could be used to reduce spam and remove sensitive personal details. The team met point 8 of the Standard. All the code was available on GitHub. A suitable license had been chosen. Understand how they can open up other internal components that they used. The team met point 9 of the Standard. Consider the reliance on closed formats like DOCX and XLSX. Even though they are for internal use only, it still restricts the technology choices available to you. Ensure that all PDFs comply with PDF/A – or republish them as HTML5 as set out in GDS guidance. The team met point 10 of the Standard. There are a good range of pre-prod environments. The service was well tested across multiple devices – including automated testing. The team met point 11 of the Standard. The team had a sensible backup strategy. There are good business processes for dealing with unexpected extensions. There is an external facing helpdesk able to directly raise issues in JIRA. Test their backups – and perform a recovery exercise. Consider whether teams other than ops need to get alerts. The team met point 12 of the Standard. In usability testing, the team found that there was little difference between the first time users and experienced users in being able to complete tasks. There is assisted digital support in place via the enquiry handling team who are trained and experienced. The team recognise the need for more complex features to be tested, such as the need for larger tables and different types of consultation. Ensure the HTML editor is accessibility tested. Test on different screen sizes and devices themselves (see point 5). Test the guidance teams uploading different types of document. Test all edge cases in the journey, so when the user submits an error, uploads something of the wrong format, tries to login with the wrong account etc. to make sure the experience works in all scenarios. The team met point 13 of the Standard. NICE has a design system that is based on existing GDS components. There is a team who own the design system, but the service teams are responsible for designing and testing new components. The team met point 14 of the Standard. The team are working with internal users in private beta to make sure the service works for their needs and they can use it. Sponsors from internal users’ teams come to showcases and report back. Explore how external users (the public) with low digital access and ability can use the service. The team met point 15 of the Standard. The team has goals set up for full user journey and can track drop off at different stages. Track user journeys across all parts of NICE domain (team have this on their roadmap), so that an exit to another NICE site is not treated as an ‘exit’. Track how people use the service over multiple sessions. Make sure there is someone in the team who can access and report on analytics regularly. This can be the responsibility of someone already in the team. The team met point 16 of the Standard. Team have used creative methods, such as a time-motion study, to benchmark current performance. There is a sponsorship group who have agreed KPIs. Look at whether a cost/benefit analysis on potential new features will help them prioritise the roadmap. The team met point 17 of the Standard. The team met point 18 of the Standard. The team will be demoing the service to their board on multiple occasions. Do further rounds of usability testing with external users and iterate the service. Test service with internal and external users who have access needs. Test on different devices and screen sizes. I’m a delivery manager in Technology Services. It’s a relatively new role for me which has been challenging and a steep learning curve. I’m achieving results and continuing to build my experience, but it’s not the only role I do in DWP. I’m also volunteer with the Government Access Point (GAP) project, part of Civil Service Local (CSL). The project is led by a team of around 20 people who make a real difference by supporting some of the most vulnerable citizens in our community – a team I’m proud to work with. What are Civil Service Local and GAP? CSL is a cross-departmental team bringing together departments and agencies to work together. It’s a programme for colleagues to engage with the community and help people build capability working in real and meaningful projects, GAP being just one of many in the North West. GAP is a cross-government network of people with professional expertise from different departments, including DWP, Land Registry, HM Revenue and Customs, Ministry Of Defence and the Lancashire Wellbeing Services, working collaboratively to provide a friendly face-to-face service, practical information and joined-up advice. And from time-to-time just chat, listen and provide support to those in need. I’ve been a part of CSL North West for 3 years now. I got involved because I wanted to develop myself, give something worthwhile back to the community and make a difference. I can honestly say that I have accomplished this on more than one occasion. Volunteering is also an alternative approach to learning and development and benefits me. Working with like-minded people I’ve been provided with opportunities to share ideas and best practices. It’s enabled me to see the views of others, find out about different ways of working and learn how we can work together with combined skills to solve issues. I work in local hospices with terminally ill patients to signpost them to benefit advice services and help them to deal with their personal affairs. One of the hospices I work at is the Trinity Hospice in Blackpool. The unit offers a 16-week programme to their patients. It has a day therapy unit that gives patients the chance to enjoy a wide variety of therapies and activities and a change of environment and scenery, promoting physical, psychological and spiritual well-being. GAP volunteers provide face-to-face practical information and support to both patients and their families. Being part of GAP has increased my knowledge on government information, the wider civil service and helped me to build links with wider organisations. The project is a great opportunity to use the skills I’ve gained working in various roles throughout my career. It also enables me to use my personal experiences, expand my knowledge of what support and services are available and to promote the digital agenda with claimants. It’s helped me to improve my team working skills and – most importantly – support vulnerable citizens in an environment they feel comfortable in, at a difficult time in their lives. 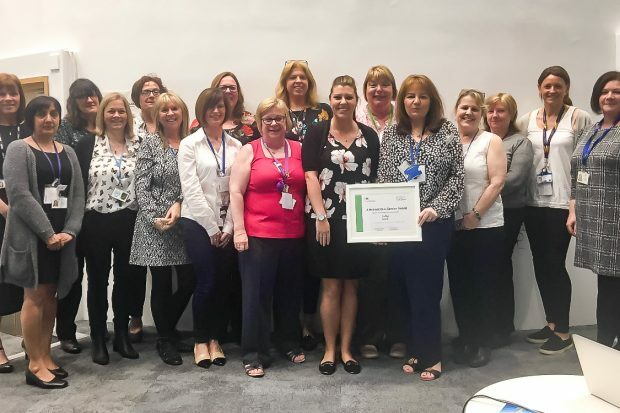 Although we do what we do ultimately to help people, I was particularly proud when the team was nominated for a Brilliant Civil Service Award in 2018. The awards, open to all civil servants, celebrate outstanding examples of the Civil Service Vision in action. And although we didn’t win we were delighted to be highly commended for our work. Being part of GAP can be emotional but it’s also very rewarding. I’ve met some great people – both patients and colleagues – heard some fantastic life stories, and feel privileged to have joined such a positive and committed team. I’ve been able to take part because I have the support of my line management. My managers understand that offering unique opportunities and inspiring people to be active in delivering the Civil Service Vision is an investment and helps their employees to be the best they can be. If you’re interested in finding out about the work we do throughout Lancashire and Cumbria, drop me a message in the comments box below and I’ll be in touch. If you’re interested in working at DWP Digital check out the latest vacancies on our careers site.